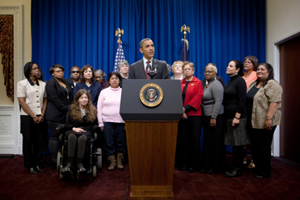 Elva (right) in Washington with President Obama. I became actively involved in our union eleven years ago when Santa Barbara County threatened to eliminate worker contracts with Addus Healthcare. Not long after I became an advocate, my colleagues elected me as their chapter chair. Since then, I have participated in bargaining, served on advisory boards, and helped organize many campaigns. One of my proudest moments happened in December 2011 when I traveled to Washington, D.C. as a representative of all UDW home care providers and stood side-by-side with President Obama as he called for a change to the Fair Labor Standards Act to give us the same rights to minimum wage and overtime that other workers enjoy. I am passionate about this work and my role as a leader because it is a way for me to unite in solidarity and support with all home care providers. We are currently paid poverty-level wages for providing crucial care to elders and people with disabilities: it is essential that we all get involved to help build a stronger union! I have seen the difference between having a union and not having one, so I know how important UDW is to its members. I am originally from Morelia Michoacán, Mexico, but have lived for the past 36 years in Lompoc, CA with my husband. Together we raised two wonderful daughters and are the proud grandparents of four grandkids. In my spare time I enjoy spending time with my family and getting to know other union members on a more personal level. I also enjoy the time I spend with my two different clients who—although they are not related to me—feel like family.